In today’s post, I want to share three lessons I learned from Brian Carruthers. In case you don’t know who Brian is, he happens to be a seven figure earner in our industry. He’s also an author, top trainer and sought after speaker. What I like most about Brian is his no-nonsense leadership style. He is to the point and is what I consider to be a man’s man. He tells it like it is. Although I have never met him personally, I’ve followed his training for YEARS and it has helped me immensely. 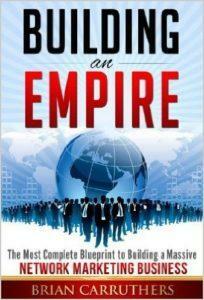 His book, Building an Empire happens to be one of my favorite MLM Books of all time. 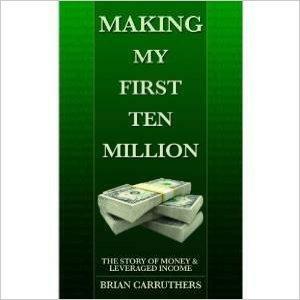 In addition, his other book, Making My First Ten Million is a great prospecting tool. This is some of the best MLM Advice I have ever heard. What I want to do in the paragraphs below is share my own thoughts on these three valuable lessons. This business is a numbers game. You must work the numbers if you want to succeed. You can solve every problem in you have in your business simply by making more exposures. You have to get out there and see the people. As a part-timer, you should be contacting minimum 5-10 NEW prospects per day. As a full-timer, you should be contacting at least 30-50 people per day. Most people in our industry, at least 98%, do not make enough exposures to build a successful business. You need to take all out massive action and you must do it consistently. These exposures need to be done with NEW prospects, not the same people over and over. Show me the activity in your calendar and I can almost predict with 100% accuracy your level of success in the business. Have you heard this before? I bet you have. You see, 99% of your prospects are not just going to sign up on the spot, the first time they learn about what you do. Most people will need multiple follow-ups and multiple exposures before they join your team or buy your product or service. Most of my own prospects need at least 5-10 follow ups before they buy or join, and most of my prospects take minimum two to six weeks from the time they are first exposed until they actually buy or join. You need a good follow up system. You must realize that recruiting is a process, not an event. If you don’t stay in touch with your prospects frequently they will not buy your product or service or join your business. You need to follow up with people consistently UNTIL they are ready to buy. Most people will need minimum 10 follow ups before they buy or join your team, so you have to stay in touch and walk people through your follow-up process. You cannot make anyone successful or drag anyone across the finish line. Your new distributors must meet you at least half way. Most people you sponsor will talk a big game, but I highly suggest you watch what people do, rather than focus on what they say they are going to do. Talk is cheap! Your job is to give your new people a task. They need to complete the task. Basically, you throw them a basketball and if they pass it back to you, you throw the basketball back to them. You keep doing this until they either quit the business or become independent of you. It must be quid pro quo. You can’t be the only one doing all the work or always trying to motivate the other person. It must be a two-way street. You must realize that each person in your team is their own independent business owner and it’s not your job to motivate them or make them successful. There you have it folks. These are three lessons I learned from Brian Carruthers. I hope you found the information helpful and I hope you will apply it in your own network marketing business. What are your thoughts? What do you think about this advice? Leave a comment below and share your thoughts. I look forward to hearing from you. Have a great day!